Your comprehensive central heating engineer in Midhurst. 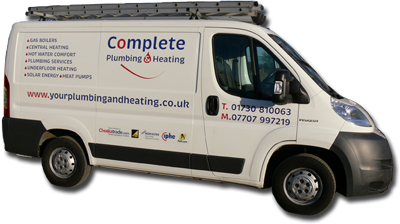 As a central heating engineer in Midhurst, Complete Plumbing and Heating is available to help with central heating installations and boiler repair. We can provide a professional boiler service as well as help save you money by installing energy saving services such as power flushing. Our central heating and plumbing services cover a wide area including Midhurst, Petersfield, Haslemere and Petworth. All of our Worcester Bosch boiler installations are backed by a 5 year guarantee. Looking for a new central heating system? Complete Plumbing and Heating’s experienced central heating engineer in Midhurst has the knowledge to advise you on the central heating system most suited to your home. Ensuring your boiler has a regular boiler service means that you can rest assured that your boiler will be working safely and efficiently at all times. A regular boiler service from our central heating engineer will also help keep boiler breakdowns to a minimum. Murray, has over 20 years experience as a central heating engineer in Midhurst. With the skill to make any boiler repair and the expertise to carry out an efficient boiler service, he will make sure your boiler is working to the best of its ability. Want to save money on your heating bills? Power Flushing not only improves the performance and efficiency of your radiators, it also prolongs the life of your central heating system, saving you time and money. Over time, sludge, dirt and debris build up and cause blockages, which prevent your radiators from distributing heat around your house. This build up seriously affects the efficiency of your central heating system leading to higher fuel bills and needing a replacement system sooner. Our central heating engineer in Midhurst can travel across the local areas from Petersfield to Haslemere and Petworth to Guildford, to carry out professional power flushing to your central heating system and help you start saving money on your gas bills. Need a reliable heating engineer & Plumber? From a leaky tap to repairing burst pipes, we can undertake jobs of all sizes. Murray has the expertise for all plumbing repairs in Midhurst, Petworth, Petersfield and Haslemere. We have an excellent reputation across West Sussex for providing a no nonsense, high quality plumbing and central heating service. As a Registered Worcester Bosch installer these high standards are backed by a full 5 year parts and labour warranty on all of their heating products. Call us for a personal service, where we will maintain good communication with you during the course of any work we carry out. We will provide you with sound advice, no nonsense, high quality service. Your custom and satisfaction is very important to us.